It is not uncommon that a baby is born with "skin tags" around the front of the ear. They are also NOT the same as the skin tags that develop later in adulthood which are benign and easily removed. Infant skin tags may contain not just skin but also fat and cartilage. Infant ear tags often occur by themselves, but sometimes may occur in association with anomalies of the kidney, inner ear, craniofacial bones, and potentially other structures. 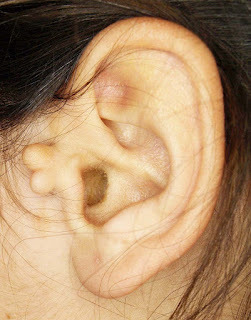 The pediatrician will often evaluate for any systemic abnormalities that are associated with infant ear tags, but often will refer such patients to an ENT to get hearing testing done to determine whether any hearing loss is present due to abnormal inner ear development. As long as such ear tags, which are known as accessory tragus or branchial cleft remnant, lack cartilage and have a narrow stalk, they can potentially be tied off and strangulated using a thread. However, if cartilage is present or the base is too wide to tie off, removal would require surgical excision. Ear tags will not go away on their own. When such ear tags are on the ear around the helix or tragus, there is minimal risk present with excision. However, if the tag is located further away from the ear and is located more over the cheek region, there is a very real risk of permanent facial paralysis because the facial nerve is located just under the skin. In some cases, the skin incision itself made to remove the skin tag may accidentally cut or injure the facial nerve resulting in paralysis. 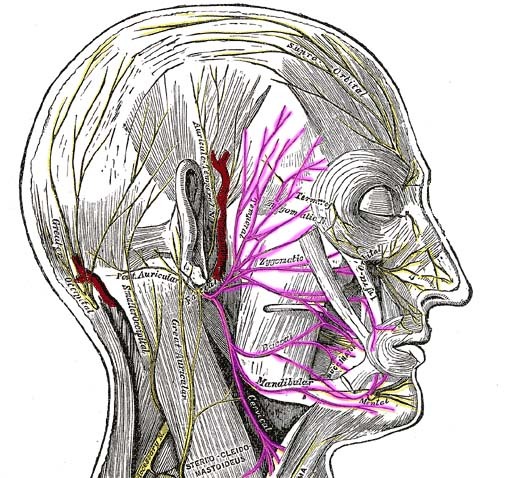 With time (years), the facial nerve gets buried deeper and deeper away from the skin such that by adulthood, the facial nerve is located 2cm or more below the skin around the ear region (closer to the surface towards the midline face and deeper under the skin further away from the midline). As such, one typically waits until around 4 years old before removing skin tags that are more on the cheek region rather than on the ear in order to minimize risk of facial nerve injury. Anatomy of the facial nerve in fetuses and stillborn infants. Plast Reconstr Surg. 1966 Jun;37(6):566-74. The early development of the parotid gland around the facial nerve and its branches in man. Anat Rec. 1970 May;167(1):63-77.